Tests of a 20-month-old Japanese steer for bovine spongiform encephalopathy have come back negative. The steer was slaughtered last week and initially tested positive for BSE, but according to wire reports, further tests showed that the young Holstein did not have BSE. 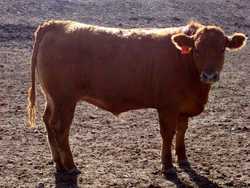 I will repeat, the 20 month old steer did not have BSE. The implications if it did would have been staggering but since it didn't we don't have to worry about it. This is the reason that the USDA doesn't want to test every cow that is slaughtered in the US for BSE. They are afraid they would be overwhelmed with false positives worrying consumers. They claim it is the cost stopping them but testing would be cheaper than the NAIS plan they are pursuing. The only difference is the cost of testing would be borne by the meat packers where the cost of NAIS is borne by the producers of cattle, the ranchers. Guess which side the USDA came down on. No surprise there.